Official Press Release |Two weeks ago at the Pittsburgh Penguins Stanley Cup championship parade, veteran forward Bill Guerin gave a quick speech to the 375,000-plus fans from the stage. The fans greeted the free agent to be with a chant of, "One More Year!" Guerin got the message and made it official on Monday, signing a one-year contract with the Penguins. "It was important to stay," Guerin said. "From the day that I got to Pittsburgh after the trade deadline, I felt good there. I felt it was a good spot for me. My family was comfortable there. We're thrilled about it. We had a great experience in the city and we were really hoping this would work out the way it did." Guerin was scheduled to become an unrestricted free agent on July 1 but opted to remain with the Penguins. With the contract out of the way, Guerin and his family plan on making Pittsburgh their home next season and will start looking for their new home. "Getting it done before agency is huge," Guerin said. "It's just a couple of days but it gives us time to get a head start on preparations, family-wise. Now we can get situated." Guerin credited Penguins general manager Ray Shero with getting the deal done quickly and pain free. "We're happy to have him back," Shero said. "His family wants to be back in Pittsburgh and they're going to move and make Pittsburgh their home for the next year and maybe more. We'll see." 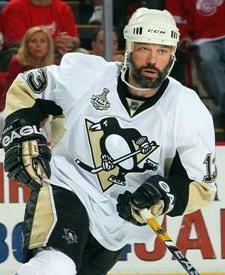 Guerin was acquired at the NHL trade deadline and the 17-year NHL veteran made an immediate impact on the team. He was a calming presence in the locker room and a strong leader for the young team during their Stanley Cup championship run. "Bill Guerin was a really good addition for us," Shero said. "He provided us with great leadership both on and off the ice. We're really happy to have him back and we're really happy he wanted to be back with this group that he won with." After joining the team, Guerin tallied 12 points on five goals and seven assists while forming a strong bond with linemate center Sidney Crosby. Guerin was even better in the playoffs, posting 15 points on seven goals and eight assists en route to hoisting the Stanley Cup for the second time in his career. "I've had time to reflect and I still don't really believe it," he said. "I see pictures and try to grasp everything that's happened. It was such a great time. Hopefully we all have a good summer, get rested and ready to make another run at it." Despite the shortened offseason, Guerin's focus for the upcoming season is to help the team defend its championship title, but knows that it will be a difficult task. "It is a short offseason but it's well worth it," he said. "The preparation will be different with everybody gunning for you. The physical part is easy. Its the mental aspect of preparing to be defending champs. It's most important to remember that it doesn't come easy."